Alex Monteith 2011 Chartwell Red Session Expression Session video documentation compiled from surf contest performance from Alex Monteith on Vimeo. Sports-stills, Chartwell Red Session Expression Session, Alex Monteith 2011 from Alex Monteith on Vimeo. Still-photo sports documentation of surfing maneouvres performed during the Chartwell Red Session Expression Session. Shot by ASP Subaru Pro photographer Daisy Day. Back Beach, Taranaki, Aotearoa, 12.00-12.30, 30 April. Chartwell Red Session Expression Session was a collaboration between the worlds top female surfing competitors, NZ competitive surfers, Craig Williamson, director of the 2011 TSB Bank women’s Surfing Festival Taranaki, and artist Alex Monteith. The artwork was a surfing contest in the expression session genre. The Chartwell Red Session Expression Session heat contained the highest number of attempted aerials, allyoops and 360s surfed in any heat during the suite of 7 contests held in Taranaki throughout the week. 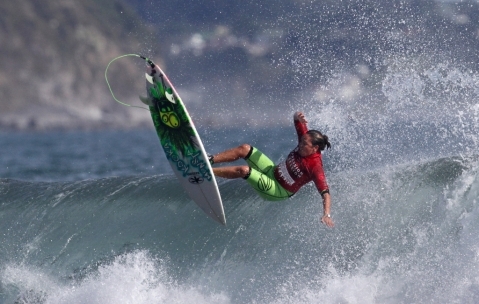 In 2011 Aotearoa hosted ASP pro tour event The Subaru Pro; the 3rd stop of the six contests that make up the 2011 ASP tour circuit. Paige Hareb (Taranaki NZ) is the first ever New Zealand athlete to qualify for the Association of Surfing Professionals Dream Tour, in which the top 16 ranked surfers in the world compete for the world title. The Subaru Pro is the most significant women’s surfing event to take place in Aoteroa in 2011. The Subaru Pro was competed as part of the TSB Bank Women’s surf festival 2011. This festival is one of the biggest in terms of the divisions surfed anywhere in the world, where the NZ women’s open, the NZ women’s senior, the NZ women’s longboard and junior national titles were competed along with the Subaru Pro during a 6 day period. The Chartwell Red Session Expression Session was a contest situated amidst this programme within the surfing festival and was held on day 6 between the semi-finals and finals of the Subaru Pro in front of a large public audience at Back Beach foreshore and upper carpark areas. Actions of the project were to present an expression session surfing contest with contest vests and prize money as an integrated part of the TSB Bank Women’s Surfing Festival Taranaki 2011. The event was publicised as part of the festival and was advertised on p11 of the festival brochure. The Chartwell Red Session Expression Session was won by Courtney Conologue (world #14). For the project a limited edition set of custom rash vests were designed by Alex Monteith (30) and manufactured by Bodyline NZ (the same company that also produced the ASP Subaru Pro competition vests) for the competitors to simultaneously compete in. The red rash vests displayed the artwork and expression session title "Chartwell Trust Red Session Expression Session", Taranaki, Aotearoa, and the names of the 2011 ASP pro tour top 16 (as of January 2011). The rash vests were distributed to competitors from the ASP pro tour com petition vest collection area. The project was a surfing contest which was run according to the ASP rules for an expression session, was judged by the Subaru Pro 2011 ASP judges, was comentated by Paige Hareb (world #9) and Sofia Mulanovich (world #05). Entry into the Chartwell Red Session Expression Session was determined as current ASP pro tour competitors plus wildcard, former pro or top level amature national title holders. Alex Monteith competed in the NZWO, in an unsuccessful attempt to win the wild card entry into the Suabro Pro and Chartwell Red Session Expression Session. Art patrons the Chartwell Trust contributed the prize money of the expression session. The winnings were designated to be passed on by the winner to the NP Boardriders already existing initiatives for the protection and enhancement of the Taranaki coast (this occurred just after the contest prize announcement).